Koubychine, Y.A. 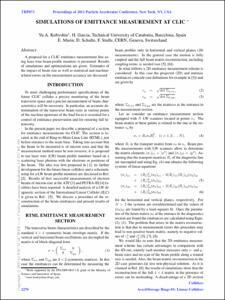 ; Garcia, H.; Marín, E.; Schulte, D.; Stulle, F.
A proposal for a CLIC emittance measurement line using laser-wire beam profile monitors is presented. Results of simulations and optimizations are given. Estimates of the impact of beam size as well as statistical and machinerelated errors on the measurement accuracy are discussed. Koubychine, Y.A. [et al.]. Simulations of emittance measurement at CLIC. A: Particle Accelerator Conference. "Proceedings of the 2011 Particle Accelerator Conference". Nova York: 2011, p. 2270-2272.